The best part is that this keeps for so long in the refrigerator. The longest that mine has sat in there is about 5 months! I mean wow!! I have made use of these on Pizzas, added them to pasta/ spaghetti, on my nachos, etc.. Never been disappointed!! The best part is that this recipe calls for the most everyday, fuss free pantry basics. Once you have washed, dried and sliced the peppers, it basically takes 15 minutes from there! We will start with washing and wiping the peppers dry. Next, slice all the peppers. They must neither be too thick nor too thin. Take a pan, heat it on high flame. Add water and vinegar to the pan. Once these come to a gentle boil, add sugar, salt and crushed garlic. Stir a few times. Let these cook together for 10-15 minutes or until the sugar melts completely on medium heat. Turn off the heat and let the brine cool down completely. 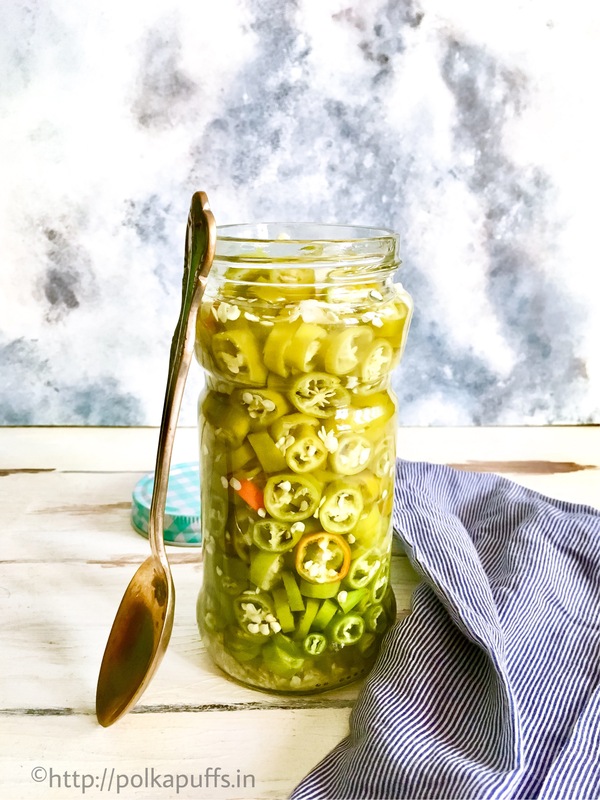 Fill a clean, sterilized glass jar with the sliced peppers. Pour the brine over the peppers. Put on the lid and gently shake to evenly distribute the brine. Let this sit at room temperature for an hour. Refrigerate without opening the jar for 2-3 days. You will see the color of the peppers change from dark green to slightly mossy green. They are now ready. 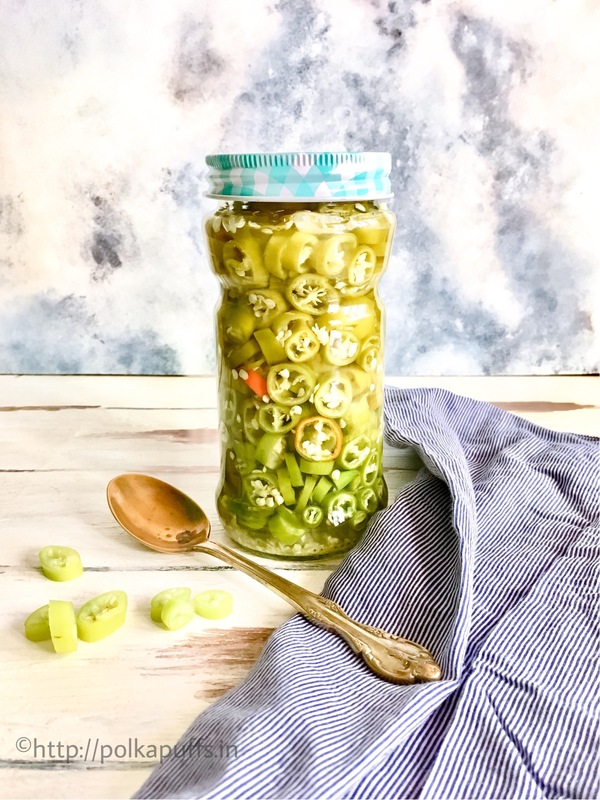 Homemade Fridge Pickled Jalapeno Peppers are absolutely easy to make with just 6 basic ingredients and so big on flavors! Refrigerate without opening the jar for 2-3 days. You will see the color of the peppers change from dark green to slightly mossy green. Use regular fat green chilies (Indian pakoda mirchi) if Jalapeno peppers are not available. Always cool the brine completely before pouring over the peppers. We cool the brine because we are not cooking the peppers, we are pickling them. Follow the measurements for best results. This stays fresh in the refrigerator for about 2-3 months although I've had them in mine for over 5 months without any problems.